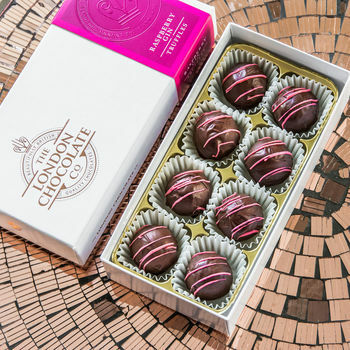 Artisan truffles with London Gin and Raspberry, surrounded in a fine dark chocolate shell. 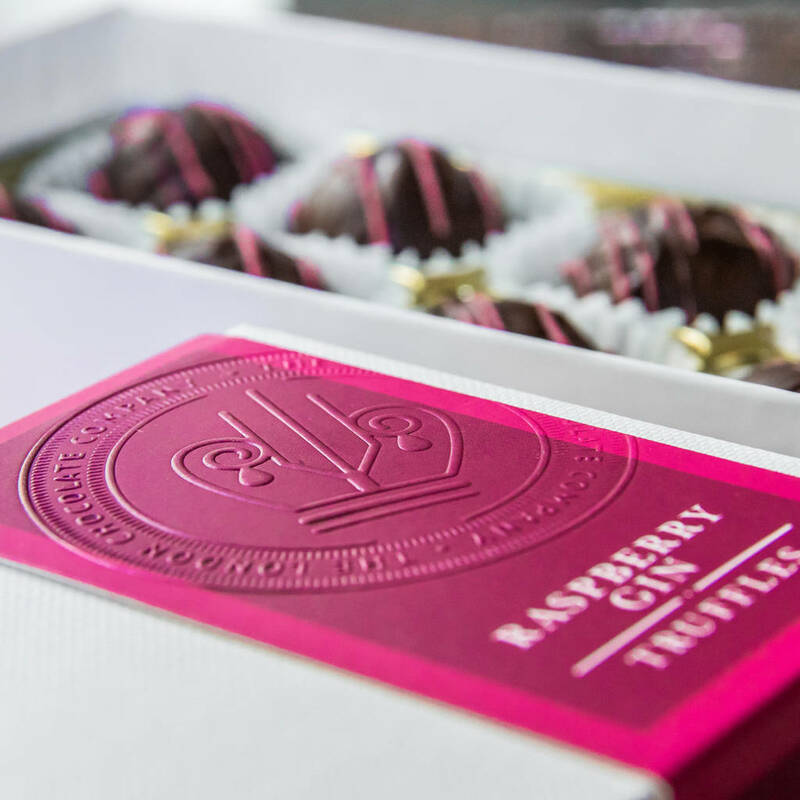 Inspired by Sloe Gin, these truffles make a lovely gift for a gin enthusiast. 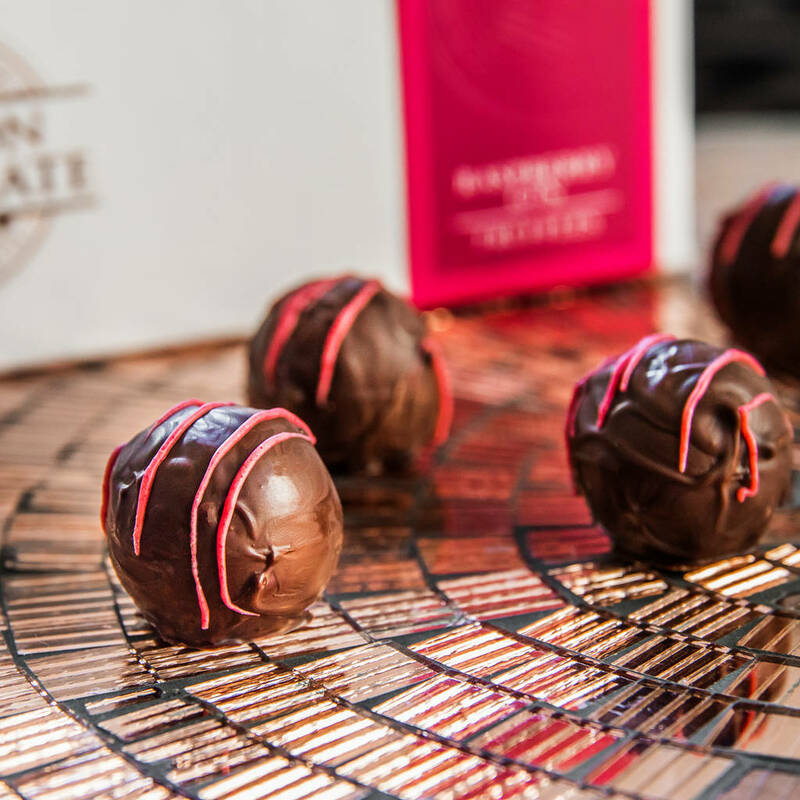 We created a smooth white chocolate ganache and blended in premium London Gin and a hint of raspberry.We finished the truffle with a fine dark chocolate shell.The chocolates are made in London by our team of expert chocolatiers who have been producing luxury chocolate for over 10 years. Dark chocolate (61%) (cocoa mass, sugar, cocoa butter, emulsifier: soya lecithin), white chocolate (17%) (sugar, cocoa butter, whole milk powder, emulsifier: soya lecithin; natural vanilla flavouring), fresh cream, gin (4%). Raspberry gelee cubes(3.2%): fructose glucose syrup, concentrated raspberry puree, sugar, wheat fibre, gelling agent: pectin, acidity regulator: malic & citric acid, concentrates (blackcurrant, black carrot, blueberry), natural colouring: (cocoa butter, beetroot). Contains: Soya, Gluten, Milk. May contain traces of nuts.